TLS, 1p, 4to, Northside Center for Child Development, Inc, New York, September 15, 1955. To Dr.Andrew M.Burris. 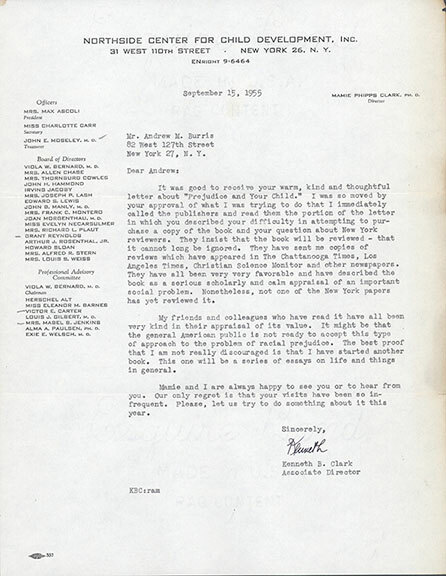 Important letter from a pioneering black psychologist who, with his wife, extensively studied the damaging effects of racism and segregation to both black and white children. Reads in part, "It was good to receive your warm, kind and thoughtful letter about "Prejudice and Your Child". I was so moved by your approval of what I was trying g to do that I immediately called the publishers and read them the portion of the letter in which you described your difficulty in attempting to purchase a copy of the book and your question about New York reviewers. They insist that the book will be reviewed- that it cannot long be ignored. THey have sent me copies of reviews which have appeared in the Chattanooga Times, Los Angeles Times, Christian Science Monitor and other newspapers…they have described the book as a serious scholarly and calm appraisal of an important social problem…not one of the New York papers has yet reviewed it…It might be that the general American public is not ready to accept this approach to the problem of racial prejudice…"
JOHN HANCOCK (1737-1793). Merchant, statesman, patriot; first to sign Declaration of Independence. 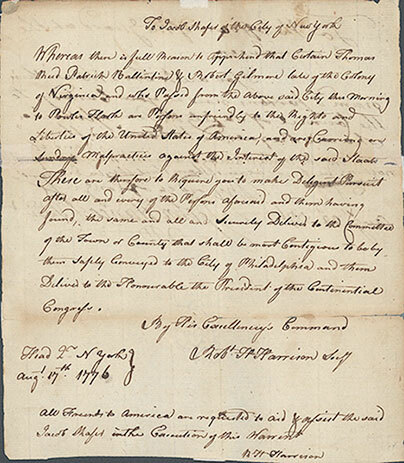 ALS, 1p, 4to, [Philadelphia], August 22, 1776. “To the Officers of the Guard at the Indian Queen”. Note: The”Indian Queen” was a hotel in Philadelphia which was used to house prisoners. ROBERT HANSON HARRISON (1745-1790) American lawyer and jurist; aide-de-camp to General George Washington from 1775-1781, the second longest serving in that capacity next to Tench Tilghman. 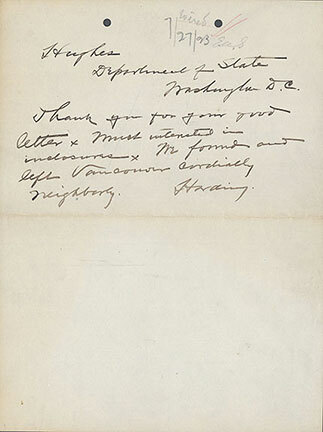 ALS, “Robt H Harrison Secy” with a postscript signed “R H Harrison”. There was a Jacob Shafer in the Berks County militia who may have been stationed in New York in 1776. 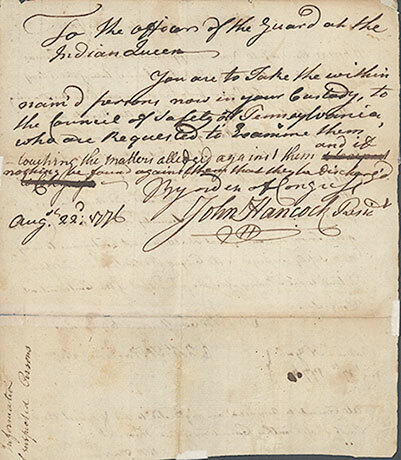 An amazing pair of letters linking two great American patriots just a month or so after the Declaration. 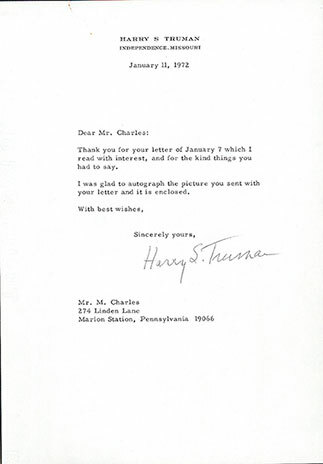 Also note the early use of the term, “United States of America” in Harrison’s letter. After the War Washington nominated Harrison to the Supreme Court of the United States, which he refused because of ill health; he died a few months after he had been confirmed by the Senate. “Hughes Department of State Washington, D.C. Undoubtedly the last example of a letter written by President Harding as he died on the evening of August 2, 1923, just six days after he sent this telegram to Secretary of State Charles Evans Hughes from Washington. He and his entourage had taken a train to the West, becoming the first sitting President to visit Alaska and Canada. On the 26th of July he gave a speech at the University of Washington stadium to 25,000 people but rushed through it and did not even wait for applause. After experiencing abdominal pain, on the advice of his physician Dr. Charles Sawyer who thought his recurrence was from an previous dietary upset, Harding went to bed early on the 27th. The Presidential train pulled into San Francisco on the 29th and Harding insisted on walking to the car,which whisked him away to the Palace Hotel. It was discovered by another doctor that he had a heart problem and was suffering from pneumonia, and was having a relapse. Confined to bed, he was treated with caffeine and digitalis, which provided enough relief that he was allowed to sit up on August 2nd. His wife read a magazine article praising the President and his last words were, “…that’s good, read some more”, as he fell back on his pillow and died. ANDREW JACKSON (1767-1845). Seventh President of the U.S. ALS, 1p, 4to, August 28, 1828. 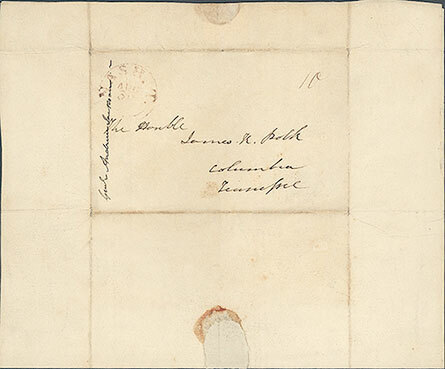 With integral leaf addressed to “The Honble James K, Polk, Columbia, Tennessee”. 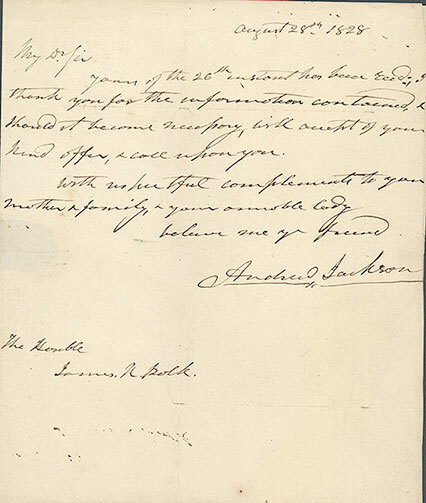 Docketed in Polk’s hand, “General Andrew Jackson. At this time Jackson, having lost the previous election four years before to John Quincy Adams, ran as the Democratic candidate and won in a landslide. 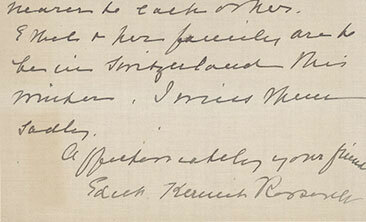 Less than six months after this letter was written, Jackson was sworn in as the seventh President of the United States. 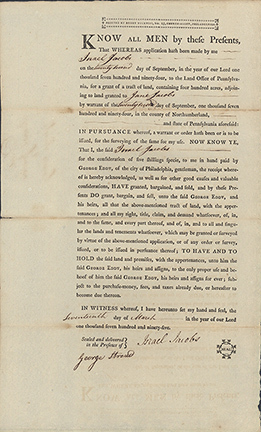 Polk was a protégé of Andrew Jackson and was a sitting member of the House of Representatives at the time of this letter; he went on to become the eleventh President. Yours of the 26th inst has been received; I thank you for the information contained, & should it become necessary, will accept of your kind offer, & call upon you. Another interesting aspect of this letter is that in addition to one future president writing another, both have penned the other’s name in their hand. DS, 1p, small folio, Northumberland County, Pennsylvania, March 17, 1795. 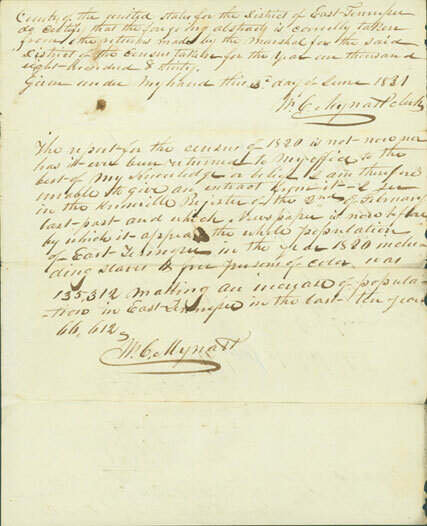 A partly printed document whereby Jacobs sells 400 acres of land which he received "by warrant" in 1794, to George Eddy of Philadelphia, for five shillings. This may have been land Jacobs obtained from a Revolutionary War soldier who had gotten it by grant for his service. Printed by Henry Tuckness in Philadelphia; countersigned by George Stroud. ANDREW JOHNSON (1808-1875). Seventeenth President of the United States who took office upon the assassination President Abraham Lincoln. Partly printed DS, 1p, oblong 8vo, Executive Mansion, Washington, D.C., June 12th, 1865. With the original printed envelope “From the President of the United States.” And a manuscript endorsement to the left, “Pass to see Ficklin”. 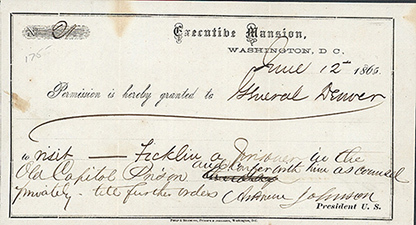 A rare pass granting permission to “General Denver to visit – Ficklin, a prisoner in the Old Capitol Prison and confer with him as counsel privately, till further orders. Andrew Johnson.” Extremely rare as very few people were allowed into this prison which housed several conspirators and Civil War criminals. General James William “Jim” Denver (1817-1892). American politician, soldier, and lawyer. Served as a Democratic Representative from California, Governor of Kansas Territory, and practiced law after the Civil War. The City of Denver is named after him. Benjamin Franklin Ficklin (1827-1871) Graduate of VMI; helped establish the Pony Express and other mail routes in the U.S.; partly responsible for the formation of the Pacific Telegraph Company. While on a secret peace mission for the Confederacy toward the end of the war, he was in Washington at the time of Lincoln’s assassination. He had been a purchasing agent and an intelligence officer for the Confederate States. He was arrested by Federal troops and placed in The Old Capitol Prison; Mary Surratt, John Ford, and Dr. Samuel Mudd, John Mosby, and Henry Wirz were fellow inmates when Ficklin was imprisoned. Due to his connections and with the help General Denver, Ficklin was exonerated. Inscribed Photograph Signed by Hamilton Secretary I ("To Cornelius Greenway D.D. 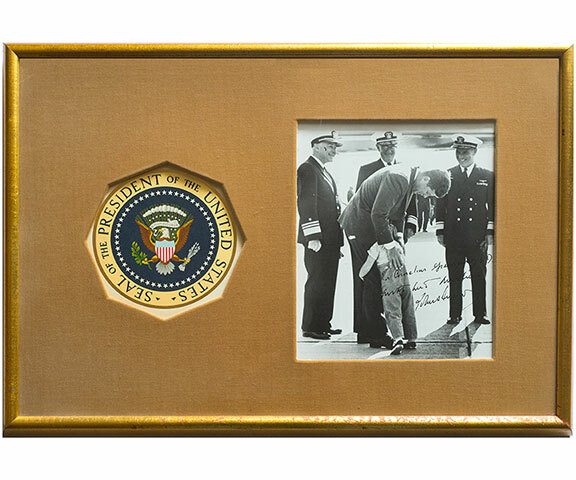 with best wishes John Kennedy"), quarto, framed with Presidential seal issued by the Treasury Department in the 1960's. Photograph probably accomplished by White House photographer Robert LeRoy Knudsen. From the collection of Reverend Cornelius Greenway, sold by Parke-Bernet in the early 1970's and purchased directly from that sale. Partial ADS "M Levy", 1p, oblong 8vo.Reads, "April 11.1790. Rec'd from the above W. Rawle Esquire to be entered up in New Castle County. M Levy". A graduate of the University of Pennsylvania, he was the son of Samson Levy, scion of a prominent Philadelphia family.He was admitted to the Bar on March 19, 1778, becoming the first practicing Jewish lawyer in Philadelphia. A very scarce autograph. 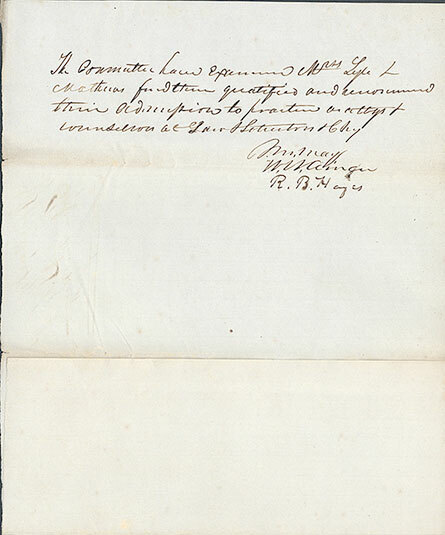 Autograph Document Signed, 2pp, 4to, [Knoxville, TE],District of East Tennessee, June 3, 1831. 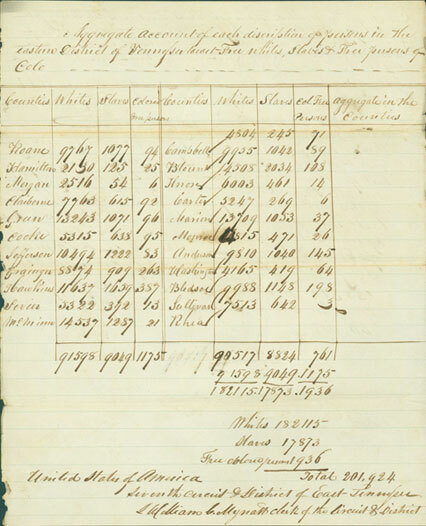 An interesting historic census document for East Tennessee listing how many Whites, Slaves, and "Colored Free Persons" were living in 22 counties. The total numberds were quite large- "Whites 182115, Slaves 17873, Free Colored Person 1936". Mynatt, a War of 1812 Aid-de-camp to General Cocke, and later Mayor of Knoxville, signs the document twice. 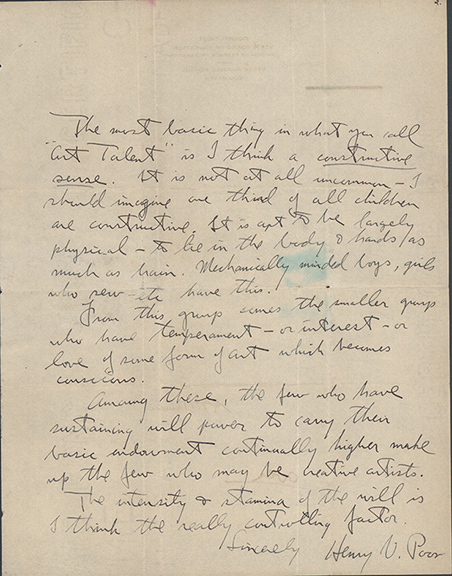 The Great Ceramatist and Painter Henry Varnum Poor Defines "Art Talent"
ALS, 1p, 4to, no date but circa 1934, on verso of a letter from Rose T. Marucci, asking him "...how art talent may be defined..." Poor, at the time one of the most important artists in the country, responds, "The most basic thing in what you call "Art Talent" is I think a constructive sense. It is not at all uncommon - I should imagine we think of all children as constructive. It is apt to be largely physical - to lie in the body & hands as much as brain. Mechanically minded boys, girls who sew etc have this. From this group comes the smaller group who have temperament - or interest - or love of some form of art which becomes conscious. Among these, the few who have sustaining will power to carry their basic endowment continually higher make up the few who may be creative artists. The intensity & stamina of the will is I think the really controlling factor. Sincerely, Henry V.Poor". 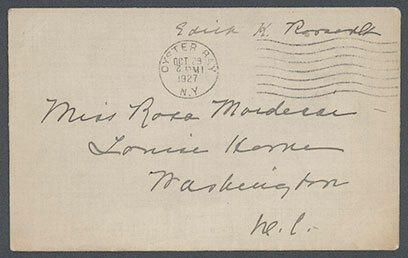 Small envelope bearing a franking signature of Edith K.Roosevelt in upper right corner, addressed to "Miss Rosa Mordecai" in Washington, DC. Also has a circular "Oyster BAy, NY" postmark dated Oct.29, 1927. Included is a two page Autograph Note Signed which reads, "Oct.29th. 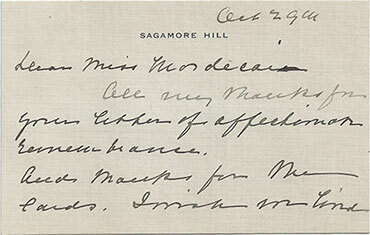 Sagamore Hill. Dear Miss Mordecai, All my thanks for your letter of affectionate remembrance. And thanks for the cards.I wish each lived nearer to each of us. E. Nicks & her friends are to be in Switzerland this winter. I miss them sadly. Affectionately your friend, Edith Kermit Roosevelt"
Rosa Mordecai was a scion of a distinguished Jewish family of merchants, physicians, educators, soldiers, philanthropists, and reformers. Faith in education as the path toward equality of opportunity was instilled in Rosa Mordecai by her father, Alfred Mordecai—a distinguished educator and businessman, the first Jewish graduate of West Point, and the foremost expert on munitions in antebellum America—and her mother, Sarah (Hays), niece of rebecca gratz, the founder of the first Hebrew Sunday school in America. 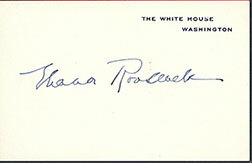 Scarce White house card signed. Mrs. Roosevelt had the longest tenure of any first lady. 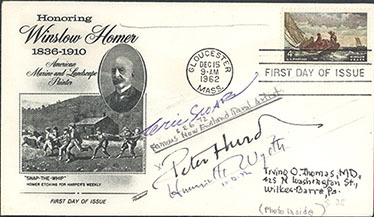 A first day cover of the 1962 Winslow Homer stamp signed by Eric Sloane, Peter Hurd (1904-1984), and Henriette Wyeth (Hurd, 1907-1997).The cover is postmarked, Gloucester, Mass, Dec.15, 1962 and bears a 4¢ stamp honoring Winslow Homer. Eric Sloane had studied under N. C. Wyeth and was an important muralist, and authored numerous art books. Peter Hurd was a western artist who also studied under N.C.Wyeth. eventually marrying his daughter, Henriette, also a renowned artist. Accompanying the signed cover is a photograph of Peter Hurd and his wife Henriette in later life. ADS, 1p, oblong 8vo, Feb.2, 1813, while in private practice. An authorization for another lawyer to deliver papers in a lawsuit.Taney later became the fifth Chief Justice of the Supreme Court (1836-1864) and delivered the majority decision in the 1857 Dred Scott case which ruled among other things that congress had no right to restrict the spread of slavery into Federal territories. This decision has been widely viewed by historians as one of the causes of the Civil War. President. TLS, 1p, 4to, Independence, Missouri, January 11, 1972. Sends a signed photograph (not enclosed); signed with his shaky aged signature.